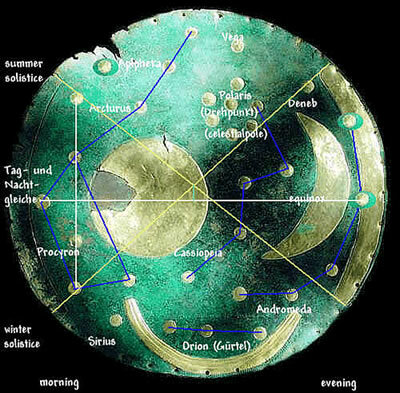 Beate Staufenbiel (webmaster@himmelsscheibe-online.de) wrote an article offering another interpretation of the Himmelsscheibe von Nebra (Sky Disc). In this case the author associates the gold symbols with the constellations Cassiopeia, Big Dipper, Andromeda and Orion, including the stars: Arcturus, Deneb, Sirius, Vega und Procyron. The sky disc "Himmelsscheibe von Nebra" is said to be 3600 years old. The sickles on the right end left mark the angle of the sunrise and sunset on the 21.12 and the 21.6. It is said that the star cluster on the disc shows the The Pleiades and that the other 25 stars doesn't show any special star or constellation. You'll get further official details if you click on the links. Sky on the 21.12.1600 BC. 21:00 made by the freeware program "Cartes du Ciel." Just click on the name to download it. One can easily recognize the constellations The great Bear, Cassiopeia, Andromeda and Orion. 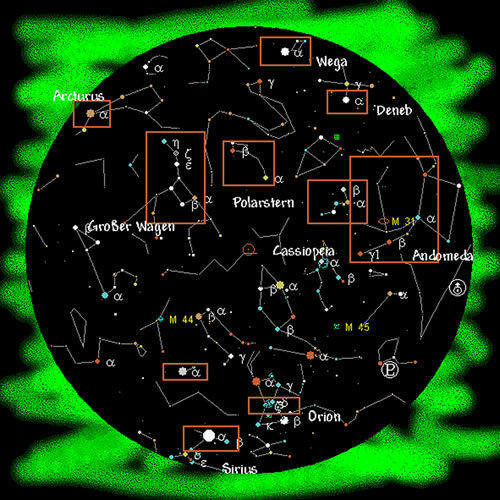 Also the stars Sirius, Vega and Deneb can be seen. This map, West and East are reversed: they can be drawn if you look up at the sky. Maybe the date 21.12.1600 BC at 21:00 is significant. If this evening was so important to be shown on such a valuable plate, it was probably the most important holiday of the year and it might have been the predecessor to the Holy Eve. The white horizontal line could have been used to put the plate in a correct East - West position. This can be done with the Indian circle. Maybe this line represents the equinox. I think it is also possible to stretch ropes along the yellow diagonals across the sky disc. At the end of the ropes sticks can be put into the ground. After the middle has been marked with a rock a new sun observation place has been built. In this way anywhere on the same latitude observation places could have been erected. Maybe every village got its own. Maybe as the number of contacts between single villages or with traders rose, certain coordination was needed. Stonehenge is on almost the same latitude and the knowledge of the two peoples was probably the same. People have to talk to trade. So the same language is needed. And if people talked on long winter evenings (due to the lack of TV) they exchanged stories, religions, knowledge and traditions. It is unlikely that peoples didn't influence each other by and by. This would mean that there were 4 days per year to hold supra-regional markets or to make deals with a defined target date. I don't think that the 7 stars are the Pleiades. The upper half of the sickles on the left and right are longer. The diagonals cross above the horizontal line. This maybe the distance which results from the fact that the summer half-year is one week longer than the winter half-year. The distance is marked with the little green line. This could be calculated to see if it fits with actual movement of the earth. Amazingly on a clay disc found on Crete there are two symbols which look like the 7 stars. (Diskos zu Phaestos) This is a calendar of the Bronze Age and it is said to be the symbol for the equinox and goniometer. These symbols are on the clay disc. If you want to trade with other cultures, you need a uniform calendar If there (countries like Egypt or Greece) was already a calendar and you had none, it would have been likely to use that. Otherwise you had to agree which one to use. So what are the six stars around Polaris if these stars are not the Pleiades ? It can't be stars according to my interpolation because there are none. The position of Cassiopeia is rather strange. Instead of 5 stars, there are only 4 stars, one belongs to the circle. Let's assume that these 7 stars represent the week. There are 32 stars altogether. 32 - 7 = 25, so 25 stars are left for something. One half-year consists of 25 or 26 weeks and 4 days. This looks very much like a calendar! How can the sky disc be used as a calendar? The first day is Polaris then count counterclockwise. The last is the first day of Cassiopeia. After 25 or 26 weeks just count into Cassiopeia. Per week one star out of the rest is counted in a certain sequence. Maybe each day was named after a god. So a day might have been called "Day of Polaris in the week of Arcturus in the summer half-year." All constellations and stars are the easiest ones to remember. Surely everyone knew them and all 32 names of the stars. So it could have been a quite popular calendar known by everyone. If one knew the sequence one could use the calendar without the plate. On the left side the horizontal line is remarkable. It is divided into 4 equal segments. This doesn't seem to be accidental. It could be the representation of a moon month (4 * 7 = 28). But this doesn't fit well to rest of calendar. It seems to be more likely that they were used to mark other important holidays as Samhain (1.11.) or Beltane (1.5.). These holidays were reported much later but the origins had to come from somewhere. There are 6 big objects and 30 stars within and 2 stars on a sickle. This is just the half of a year. But this time the year is divided into winter with spring and summer with autumn. This may be unlikely though. The sun and the moon could - besides their original meaning - represent gods. Regarding the size there were the main gods. Or they represent both half-years. If the theory of the calendar is correct, one pass of the calendar would just be a half-year. Maybe it is also important in which phase the moon is shown. But if someone wants to draw the moon he will always draw it as a crescent moon never, as a full moon for example. The sun bark could be an import of Egypt because it looks as if it is loaded with Orion and drawn by Sirius. And they were important stars in ancient Egypt. I have to point out that this is my personal theory. So read this web site critically and tell me if, where and why I am wrong! Landesamtes für Archäologie Sachsen-Anhalt 2002. © All rights preserved. Any copy of the text only with the approval of the owner. Click to launch a printable Adobe pdf version of this article. Print a copy of this article. Read The Himmelsscheibe as an Early Christian 'Lehrscheibe', an alternate interpretation for the bronze sky disk, by Herbert R. Stollorz next.